From nearly the beginning, the Western psyche has been characterized by a polarizing schism – two competing mythologies, engaged in a continuing struggle for supremacy, neither able to take complete control, neither able to relinquish the quest. Each derives from diametrically opposed, philosophical and mythological foundations, one rooted in the Near and Middle East, the other rooted in the ancient Greek civilizations of the Mediterranean Sea. These opposing traditions can be represented by two great stories: the Greek tradition by “Prometheus Bound,” the Near Eastern tradition by “The Book of Job” in the Old Testament of the Bible. “Prometheus Bound” is attributed to the great Greek tragedian Aeschylus, and it is in the character and integrity of the Titan Prometheus that aspects of the independent, assertive and defiant nature of the Western psyche can said to be traced. In the story, the Titan Prometheus (who had sided with Zeus in his battle against his father, Cronus, and all of the rest of the Titans) draws the bitterness and hostility of Zeus when he opposes his plan to bring an end to humanity, instead giving them the gift of fire. 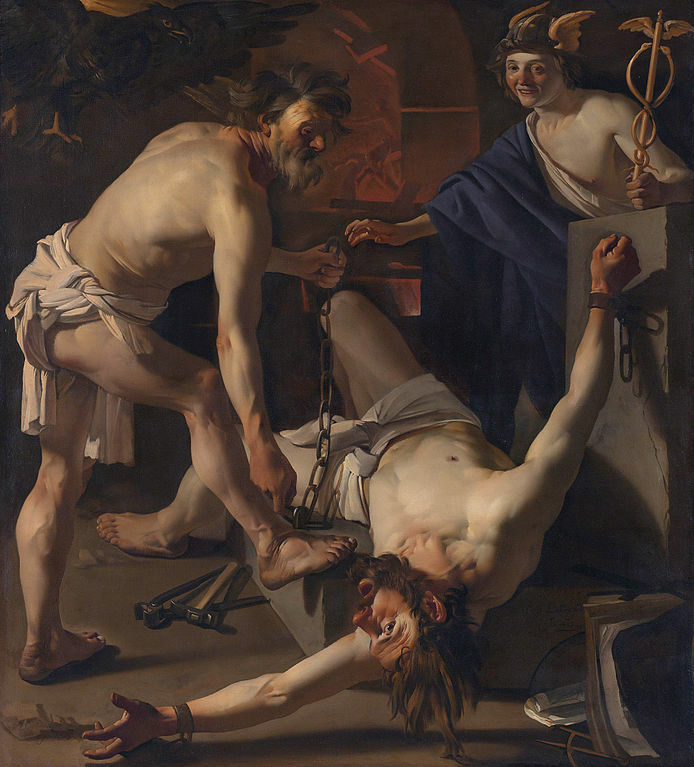 An enraged Zeus decrees that Prometheus is to be chained for eternity to a mountain in the Caucasus where an eagle would attack him and devour his liver; being immortal, however, his body would heal every night, only to have the gory and painful attack happen every day thereafter in perpetuity. These aspects of Prometheus’ character – elements of which the ancient Greeks prized as of the highest and noblest order – form one pole of the opposing nature of the Western psyche. Pride, brazenness, courage, determination, resoluteness all reflect constituent components of one pole of the Western mind. 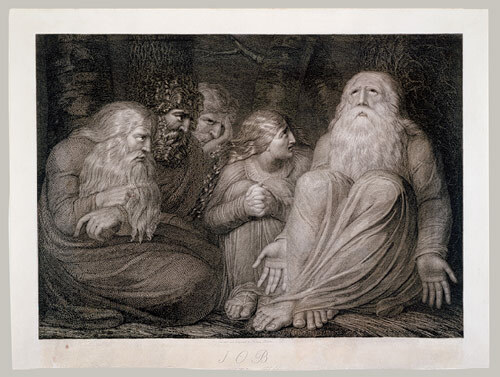 Job’s tormentors, from William Blake’s illustrations for the Book of Job. The other pole of the Western psyche can be represented by the Old Testament figure, Job, a righteous man, blessed with progeny and wealth. Yahweh, as God is referred to in the Old Testament, is meeting with his colleague Satan and, out of pride, asks him, “Have you ever seen a better servant than my servant Job?” Satan considers the question and answers him, “Your servant is loyal to you only because you bless him. Torture and take everything away from him and he will surely curse you.” Yahweh agrees to the bet, allowing Satan to strip him of his wealth, kill all of his children and livestock, visit upon him a plague of boils and make him a cursed outcast among his people. Finally, Job protests his treatment, showing how he had always been devoted to Yahweh; he demands an answer from God for all the terrors to which he has been exposed. An indignant Yahweh, however, answers out of anger and spite, “Where were you when I laid the foundations of the Earth?” Yahweh dismisses Job, angry that he would deign to question him. Job, admitting his knowledge and understanding were insignificant compared to Yahweh, repents his insolence saying, “I am ashamed!” and throws dust and ashes upon himself. This story reflects aspects of the Western psyche that include obedience, subordination, modesty, humility and even fear. Significant differences, unsurprisingly, exist between these two mythologies. For one, the Gods of Olympus, in the Greek tradition, did not create humanity; rather, they exhibited all of the emotional complexity of humankind, lusted after women and essentially acted as older siblings. The Greeks, while respecting the Gods, did not consider them to have some inscrutable divinity beyond the reach of humanity; thus identifying with the defiance of Prometheus. Humanity, in the Old Testament, is said to have been created by God to be his servants. An impenetrable gulf existed between the Divine and lowly mankind, with the wisdom of Yahweh being beyond his understanding. In one, humanity is to be a citizen; in the other, a servant. Another difference lays in the origins of the mythologies. The ancient Greek traditions grew in the Mediterranean Sea and were part of the intellectual origins of the European continent. The Old Testament traditions can be sourced to the near and middle East, and were often brought to vast tracts of the continent at the tip of a sword, as the Roman Empire expanded. The problem of most Western minds today is this: having been deprived of the sense of divinity in themselves by the church, they now have been deprived of the sense of the claim of the church by science—and so we have what is called alienation . . . In Europe we have faith in the human being. Consider for instance the main position of the Levant. When we have two terms, God and man, there comes a final question as to your ultimate loyalty— is it going to be God, or is it going to be the man? Is it going to be to the mystery of God, or to the ideas and ideals of man? Now for the Oriental [sic], this conflict, look at that: Monday, Tuesday, Wednesday, Thursday, Friday and Saturday we are with Prometheus. And Sunday, for a couple of minutes with Job, and the next Monday on the psychiatrist’s couch wondering what is the matter?